As we have seen, the economic restructuring of the GGH is accompanied by shifting spatial employment patterns and an evolving regional economic geography. Needless to say, it is essential that the Growth Plan policies and structure concept reflect the reality of that regional structure - the key elements of which we describe below. The structure of the GGH today is characterized by the very dense Downtown Toronto area, along with several other dense, mixed use concentrations of employment across the region. These include the suburban centres in Toronto and the downtowns of the GGH's older cities. We have also noted some large and important suburban employment areas, which we call employment "megazones," that straddle municipal boundaries and are poorly served by transit, so they contribute to traffic congestion in the region. The first megazone, which encircles Pearson airport, we will call the "Airport megazone." The one centred on the 404/407 highway interchange, which includes parts of Markham, the Beaver Creek business park in Richmond Hill, and extends south into the City of Toronto, we will call "Tor-York East." The third - "Tor-York West" - stretches from Highway 400 east to Keele Street in Vaughan and also south into Toronto. The economic importance of these three megazones, as well as their implications for planning the region, cannot be overstated. Map 9 shows these as well as other important employment areas. Downtown Toronto contains the GGH's most significant concentration of STEM workers, senior managers, and other professional jobs, as well as senior executives in finance, insurance, and business services, representing corporate headquarters and large downtown firms. Other high-skilled business services occupations (including middle managers and professionals such as accountants, investment analysts, brokers, and management consultants) are also concentrated in Downtown Toronto, along with government workers of all kinds. Routine types of work found in this area include accounting clerks and administrative assistants supporting finance and business services. Overall, Downtown Toronto accounts for 17.5% of core employment in the GGH. Between 2001 and 2011, Downtown Toronto grew by about 42,000 core jobs. The Airport megazone, one of the three employment megazones outside Downtown Toronto, is the second-largest concentration of employment in Canada, after Downtown Toronto. It represents almost 300,000 jobs, more than the central business districts of Montreal, Vancouver, or Calgary individually. Together, the three megazones represent 543,000 jobs (see Table 2). By comparison, Downtown Toronto has about 464,700 jobs. Y et the Growth Plan contains no formal recognition of these areas, let alone any insight into their make-up, their jurisdictional challenges, areas of job gain and loss, or potential for reurbanization. It is also important to consider the automobile traffic associated with the three megazones. Together, the three megazones generate almost 500,000 daily commuting trips in the morning peak period, of which about 475,000 are car trips. More than half of the work trips are more than 10 kilometres, further exacerbating congestion. And this number represents only work trips to the megazones. With an equal number of return trips, the contribution of these three employment areas to GGH congestion is substantial - nearly one million car trips daily. In comparison, of the roughly 450,000 daily work trips to Toronto's central business district, only 133,000 are made by car. That is, more than 70% of commuting trips to central Toronto are by walking, cycling, or transit. In general, the megazones are focused on core employment activities (Table 2). More than 80% of the jobs in the megazones are considered core employment, compared with 62% for the GGH as a whole. * These figures include only jobs with a usual place of work. Jobs with no usual place of work are excluded. ** Information on commuting for the GGH as a whole is not available because the Transportation Tomorrow Survey does not cover the entire region. Haldimand County, and parts of Peterborough, Northumberland, and Wellington counties are not included in the TTS. Source: Statistics Canada, National Household Survey; Transportation Tomorrow Survey. These figures should be considered estimates only. Clearly, the megazones are a major driver of the regional economy, representing 20% of all core jobs in the region. The megazones are not uniform, however; each represents different industry mixes, economic roles, and functions (see Table 3). The Airport megazone comprises a range of activities. Not surprisingly, there is a significant concentration of jobs in warehousing, transportation, and logistics - almost 90,000 jobs in these sectors. Industrial uses (manufacturing, construction, and utilities) also have a significant presence - almost 80,000 jobs. Finally, there are about 60,000 jobs in finance, business services, and administrative services. The Tor-York West megazone is more squarely focused on industrial activities, with about 60,000 of its 140,000 jobs in this sector. Warehousing and transportation are also significant, with 23,000 jobs. The Tor-York East megazone is composed of fairly distinct subareas. It is much more focused on finance and business services, with more than 45,000 of its 100,000 jobs in this category, mainly in the suburban business districts, such as Beaver Creek and Allstate business parks. The remaining jobs are equally split between industrial and warehousing/transportation. A significant amount of skilled, knowledge-intensive economic activity takes place in suburban business parks and campuses, which we call Suburban Knowledge-Intensive Districts or SKIDs. The jobs in these areas include finance and business services, as well as STEM occupations. We have identified five SKIDs in the Greater Golden Horseshoe (see Map 9). All of them are suburban business parks, accessible mainly by automobile. Two are in Mississauga: a sub-area in the southern part of the larger Airport megazone and Meadowvale Business Park. Mississauga's knowledge-intensive business parks contain many life sciences firms, as well as several Canadian head offices, such as GE Canada, General Mills, and Dupont Canada. A third SKID is part of the Tor-York East megazone in Markham. Markham's business parks include information technology, engineering, finance, insurance and business service firms. The fourth is in Waterloo, which has a significant number of STEM and ICT (information and communications technology) jobs. The last major area is centred on the Sheridan Business Park in Oakville. Some science-based activities exhibit a strong predilection for corporate, suburban environments, while other knowledge-intensive activities are drawn to Downtown Toronto. The pattern shown in the mapping is consistent with other research that shows different spatial patterns for different types of knowledge-based industries: "creative" firms (such as media, advertising, design, technology, and software) gravitate to dense, mixed-use, often older urban environments, and science-related firms such as pharmaceuticals or information and communications technology (ICT) to suburban business park locations (Spencer, 2015). This is because inter-firm networks are more important for innovation in creative industries, while larger, science-based companies rely more heavily on intra-firm networks and interactions. An understanding of the dynamics of location and the importance of the urban environment to economic development has important implications for planning. Table 4 summarizes total employment and core employment statistics for Downtown Toronto, the megazones, and the SKIDs (those located outside the megazones). Core employment is concentrating in these major employment areas, increasing from 37% of total GGH core employment in 2001, to 41% in 2011. * Two SKIDs are found in megazones: the Airport South SKID and the Markham SKID. **Three SKIDs are not included in the megazones: Meadowvale, Sheridan, and Waterloo. In addition to the industrial areas contained in the megazones, other areas of employment in manufacturing, construction, and utilities are found across the GGH (Map 10). These areas tend not to represent dense concentrations of employment. Areas with significant numbers of such jobs outside the megazones include northeast Scarborough, Pickering, Oshawa, northwest Guelph, Waterloo, and Hamilton. For industrial occupations, different skill levels tend to be integrated into the same areas; that is, strong patterns of specialization by skill level for these industries is not evident, at this level of analysis. In addition to the concentration of transportation and warehousing employment in the Airport and Tor-York West megazones, distribution activities tend to locate near the region's six intermodal terminals (shown on Map 11) and 400-series highways. Distribution and logistics activities are a significant and growing sector of the GGH economy. Such facilities include distribution centres for companies such as Indigo, Hudson's Bay, Walmart, Best Buy, and Canadian Tire. The expansion of these facilities is driven in part by the growth of online shopping, which has reduced the demand for physical retail space relative to sales. Distribution centres are extremely land-consuming uses: one Canadian Tire Distribution centre in Brampton consists of 1.7 million square feet (158,000 square metres) of floor space on 180 acres (73 hectares) of land. The transition to online shopping is likely still under way. This suggests that distribution and logistics activities are poised for continued growth. For example, the City of Brampton is currently considering a planning application proposing 5.3 million square feet (500,000 square metres) of warehouse distribution and office space, in 11 buildings, each between 300,000 and 400,000 square feet (28,000 and 37,000 square metres), on 320 acres (130 hectares) of greenfield land. Given the scale of these facilities and their implications for the regional economy, direction from the Growth Plan on where these uses are best located and the amounts of land that should be allocated would help reduce conflicts with other uses, and take efficient infrastructure requirements into account. 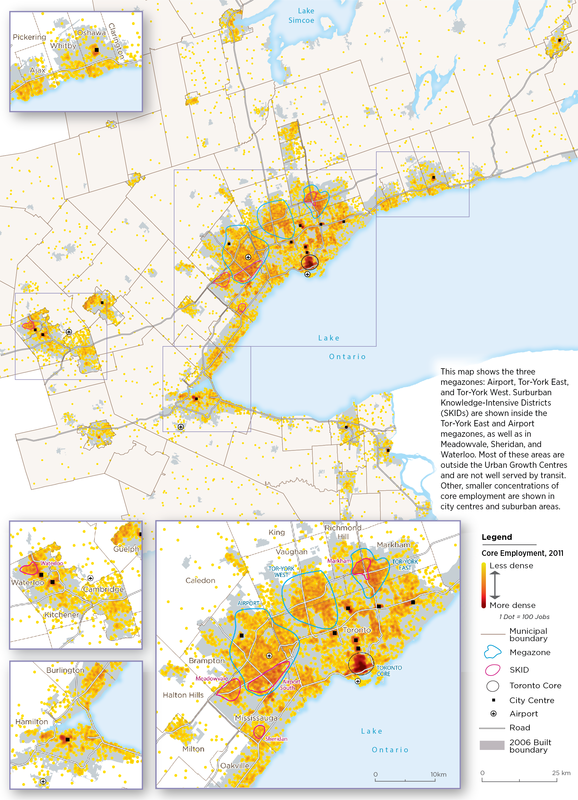 There are of course, many older downtowns in established cities in the region, such as in Hamilton, Burlington, Oshawa, or St. Catharines, as well as suburban city centres in Toronto and Mississauga. These areas are distinguished by their higher density, and wide mix of employment uses, as well as residential development. The region's economic geography includes unique or specialized economic areas such as Niagara's wine and tourism industry. Other types of special area may be focused on a specific industry cluster, such as aerospace for example, or a particular economic asset, such as a university or research institute. The Growth Plan does not reflect this regional economic structure. How the Growth Plan might better do so, while taking into account the dynamics of economic change and competitiveness, is addressed in the following section. We calculate the areas surrounding the airport to represent just under 300,000 jobs in total, roughly the same number today as in 2006. Data cited in Shearmur and Hutton (2011) suggests that in 2006 the CBD of Montreal represented 243,000 jobs, the Vancouver CBD 203,000 jobs, and Calgary's CBD 150,000 jobs. Transportation Tomorrow Survey, trips are to Planning District 1, which corresponds to Downtown Toronto. Among jobs having a usual place of work.